Sometime this week, the Nationals will clinch the National League Eastern Division. The pennant will be theirs. And while there are some who consider it gauche since we've never worn a uniform, we'll all consider it ours too. We've been there since the beginning, suffering through year after year of lousy play, lousy players, lousy managing, lousy broadcasting, etc. So it's time to shovel dirt on all that. Those Gnats jokes? Dead. Buried. Those "The Plan!" jokes? Ok, they're not fully dead yet... I want to kick that horse a few more times just to make sure. But "Natinals?" Yeah, that's dead. So in the spirit of embracing the dead, the "Most Natinal" project was born. Let's celebrate those sub-mediocre years, remember the not-so-greats, and admire just how far this team has come since the time that Jim Bowden thought signing Vinny Castilla and forfeiting a pick would be a good idea. We received almost 200 ballots... so thanks to everyone who took a few minutes. And I'm happy to announce the first batch of the Most Natinals roster! A close race, but in the end, it belongs to Wife Beatin' Wil Cordero . Jim Bowden signed Wil Cordero -- the long-time Expo -- in December 2004 to steal time from Nick Johnson at first base. And to be a leader. Yeah, that's right, at least per Ladson. On the field it was Ugh-Lee. He injured his knee early in the season, thankfully giving more playing time to Nick Johnson. When he came back, he was used primarily as a pinch-hitter. All Cordero did was pop the ball up. Sometimes it stayed on the infield. Sometimes it went to the edge of the grass. Occasionally it made it to the outfielder. He finished the season with 2 RBI... which were both Sac Flies, when he miraculously had a runner on third for one of those weak popups. At one point in the season, his batting average was higher than his on-base percentage (always a nifty trick!). Wil Cordero: A wife-beating player hailed for his leadership, signed for a role that would partially block the development of one of the team's few good young players, who couldn't perform? That's a True Natinal. 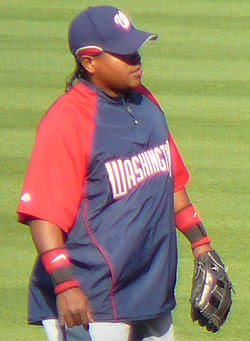 Wil Cordero is the Most Natinal First Baseman. Others considered: Daryle Ward, ah, close your eyes, and you can still picture Frank writing his name in the outfield, or refusing to DH him during Interleague play. Being used in ways that expose your weakness helps make a Natinal what he is. What I'll most remember about him, though, is him huffing and puffing and snuffing around the bases in that series against the Yankees. He was key to the big rally on the Saturday game, and his spring (lope? gallop? plod?) was reminiscent of one of those impromptu sprints a toddler does when they shift their center of gravity too far forward -- just with about an extra 240 pounds. Other prominent write-ins: Carlos Baerga (Piston legs! ); Larry Broadway (power prospect! ); Dmitri Young (sigh); Paul LoDuca (it burns! ); confidential to the person who wrote in Nick Johnson: BOOOOOOOOOO! Just two votes separated this race, and in the end, it goes to Anderson Hernandez, good ol' AHern! His transactional history sums up the experience well. The Nats got him as a PTBNL for a broken-down Luis Ayala in August 2008. Thankfully they saved the receipt, because they returned him less than a year later for some random minor leaguer. Hernandez had a sterling defensive rep. He was going to be the guy that anchored a revitalized infield, helping that no-name pitching staff to a sub-6 ERA. While the glove may have been excellent, the name the Mets fans had given him should've been the first warning sign: IPOR -- short for "In Play, Out(s) Recorded", which appeared on MLB Gameday approximately 75% of the time he came to the plate. But what makes the IPOR experience was what he did in 2008. He got a random 80 or so ABs. Hit something like .330. Combined with the sterling defense, everyone thought the Nats had a rising star... despite the, oh, 5,000 other professional ABs that said he couldn't drive the ball through a wet paper towel. When the pumkin turned back from a carriage that next season, the fans turned, and IPOR was returned from whence he came. Anderson Hernandez: A small-sample size illusion that made Nats fans think they had a hidden superstar, but in reality was a waiver-wire stiff. That's a True Natinal. Anderson Hernandez is the Most Natinal Second Baseman. Others Considered: Ah, Adam Kennedy (File Photo). As they tried to wash the IPOR stink off, the Nats turned to him because Orlando Hudson gave them the cold shoulder. (Riggleman's comment on the signing: "He's not a spectacular player.") He didn't hit. He didn't really field. And then he complained about not playing enough. Or regulary. Or something. All I know about him is that you'd randomly see his name in the Mariners boxscore playing first or hitting cleanup, and I'd thought I had a stroke. Other prominent write-ins: Carlos Baerga; Damien Jackson (too loathed to qualify); Jamie Carroll (chaste! ); Jose Vidro; Junior Spivey (an oversight on the ballot); Ronnie Belliard (Bellylard...get it... it's cause he was fat!). Confidential to the person who voted for Tony Blanco: Da Hell? I just remembered this blog existed after years and years of being away. Talk about a walk down memory lane. Anderson Hernandez never saw the ball.